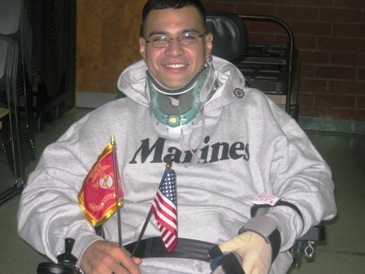 When U.S. Marine Lance Corporal Joshua Himan’s Humvee drove over a pressure plate roadside bomb in Afghanistan, he was ejected from the vehicle, broke his neck, fractured his back, and was instantly left paralyzed. Since the accident, Joshua has lived in several medical facilities and is currently undergoing a five-day-a-week therapy regimen at Walter Reed Army Medical Center. He will finish the treatment in March. The surrounding Prince William county community where Joshua grew up has been working with the Northern Virginia Fuller Center for Housing to make sure the home waiting for him is one that adequately meets the family’s new needs – a home with an accessible bathroom for easy bathing, wide doorways and hallways to allow for easy transport, and a master suite with sufficient space. "This is the first project we’ve done for a wounded veteran, and it’s an honor," Jacob Koch, president of the Northern Virginia Fuller Center, said. "I’m doing everything I can to ensure we can bring this gentleman home." The project began late last year when the coordinator helping him transition back from war contacted the Quality of Life Foundation and Azalea Charities, two local non-profits that provide aid and support to wounded veterans and their families. Since then, the Northern Virginia Fuller Center has been raising funds, securing subcontractors, and coordinating volunteers to make the addition a reality. In January, an anonymous local donor matched $15,000 in all contributions made before the end of the month to help the Northern Virginia Fuller Center for Housing complete the nearly $100,000 home addition. 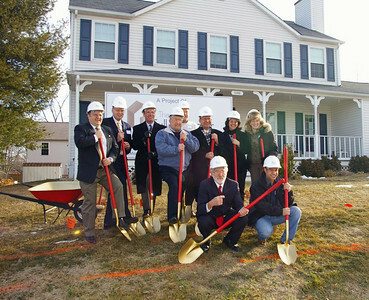 The groundbreaking ceremony for the project took place Feb. 3. Construction began the same day, and will continue through the end of March. Joshua’s welcoming ceremony will take place 10 a.m. April 2, at his home on 13451 Orangewood Drive. "It’s a tremendous honor to have so many people and organizations help not only myself, but my family," Joshua said. "I really can’t express in words how grateful I am . . . and I want to thank everyone for their help." Northern Virginia Fuller Center for Housing.